What's better than a cat? A dressed cat! We've created unique, vividly colorful dressed cat graphics for your web pages. Calling Cards, Rainbow Bridge, felines with angels-fairies-elves, blinkies, animated cats and alphabets, fashion shows and more. 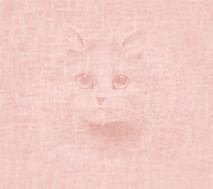 Index #1 - Cat Calling Cards: Cards with messages to convey the endearing nature of felines and to promote their welfare and care. There are also many funny cards. Index #2 - The "Imagine This" Series: Over 100 dressed felines including special characters like Puss'n Boots and King Kat, vintage care signs, Jasmine's 60's fashion show, masks, blinkies, cats with people and antiques, and more. Index #3 - Animated Cat Graphics: Rainbow Bridge, alphabets, cat fairies, holidays, the mischievous Marvin Mouse and more. Our graphics are only for use on Personal Home Pages and Animal Welfare Sites. Don't use them for any other reason. Commercial sites, please email us for permission. DO NOT take anything from other parts of this site. You may only use the images in the Cat and Dog Graphics sections. The Pink Fairy at the end of the page is our logo and not part of this collection. DO NOT resize or alter our images, or change their file names, or add them to a graphics gallery, or use them in e-mails, or hotlink them directly to this site. Save them to your hard drive and upload them to your web server. Credit with a link back to us is necessary to protect our copyright. Contact us with a name (and date if desired) and we'll create a free memorial tribute for any pet who has crossed the bridge. Use the word "Tribute" in the subject line of your email and send the URL for your pet's page. Please don't take the sample Memorial Tribute. It is not part of the graphics. There is A Menu at the Top of Each Page. Cat Calling Cards with messages. Whimsical funny cards. As in all of our graphics, many of the cards contain welfare/care messages. The Calling Cards are not E-cards. They are for web page use only. Our Red Witch Cat E-cards are here . Spay/Neuter Cards with fantasy women, fairies, children and more. Adorable children and mesmerizing beauties from long ago and far away share their thoughts on felines. Among the beautiful women we've created a few funny looking old maids. Here is Your Cat web sets, Rainbow Bridge web sets & more. Buttons at the left are from 2 sets. Get a custom 10 piece web site set with your site name. See the sets we've started. Dressed kitties, each with a different purr-sonality. This is Mayor, Jezebella, Mr. Wrong, Gypsy and Killer. Choose your favorites and find them throughout the 3 indexes. Or place them side by side. Or pair them up with our Guardian Feline Fairies and kitty accessories which you'll find in this index. Savor the Flavor of The 60's! Jasmine models retro tee-shirts, psychedelic dresses, disco and hippie tops, bathing suits, cowboy boots, jeans, jewelry, gypsy gauze skirts and other vintage clothing. Many tee shirts from funny tee-shirts to animal welfare tee-shirts. See them interact with humans. Among them, Killer and his guardians Tillie and Millie. You'll also see them at home with humans, antique and vintage furniture, and at computers and TV's. At the left is Veronica on a vintage loveseat. See Spiffy make a deal with the devil for 8 cans of tuna. Meet A feline Roman Gladiator and other fantasy creatures. See Cola give honey to an ape. Colorful Victorian and Art Deco vintage cat welfare signs and funny signs. Vintage kitty photo albums including Rainbow Bridge albums. Accessories such as food, litter box, toys and more. Here you'll meet 10 different Guardian Feline Fairies. Ever wonder how cats celebrate birthdays or holidays, or if they even know they exist? Halloween has its own page. Felines with witches, vampires, Frankenstein, gremlins, and other frightful creatures! Wonderful large images of a Fortune Teller and her cat and 12 small matching images with your zodiac sign. Cats watching mermaids in fishbowls. Big Bold Victorian and Deco Vintage Cat Blinkies. We've made him all kinds of masks. So many that he has a hard time choosing. Animated cats shopping, in litter box, on toilet, applying rouge, sewing, singing, dancing and more. Even more animated cats! Jumping rope, frying fish and more. Includes The Magic Ball. See their wishes come true. Marvin Mouse, the most mischievous mouse on the planet, does not like cats! He loves to tease them. You'll meet some of his mouse friends and relatives. Marvin has his own alphabet. Number of images: 50 plus alphabet. Use one alphabet, or mix several as we did here. We've added links to some of the matching images for each alphabet. Glamorous fabulous felines in their finest clothes to pretty up your web pages. At the end of their page you'll see why they are all dressed up. Not only for Rainbow Bridge pages. 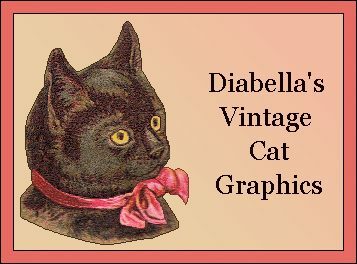 There are many beautiful vintage angels and inspirational graphics which can be used for any pets. Gates with cats, elves, fairies. Glamour-Puss is a naughty kitty! When her human leaves the house she loves to make all kinds of phone calls. Graphics are for personal and animal welfare web sites only. Commercial sites, email for permission. Attend the Kings Highway Cat Rescue "Kitty Personals" as the kitties make their pleas for homes. Visit my cats: Red-Devil, Tropicana and Count Dracula. Enter the heavens in the black of night to meet Handsome and Angel Ariella, Keeper of the Stars. Follow Katzenberg in his illustrated journey to Rainbow Bridge and meet The Rainbow Bridge Fairies. Enter The Cat Cafe where fantasy meets reality via a series of educational and fantasy cat pages in a "real" nickelodeon. Read Cat Poetry by Candlelight in The Cat Cafe on a page illuminated only by candles. Impossible? See for yourself. Meet the Spay/Neuter Witch, The Evil Crow, The Green Elf, and the many Fairies who live here. Meet me and some of the cats I've rescued over the years in Rescue III - My Rescues. Apply for one of 6 Awards.